Taking a two-year-old to the dentist is tricky at the best of times – but what if she weighs 30 kilos and has teeth like a large dog? A South American fur seal pup at Living Coasts, Torquay’s coastal zoo, is having a tooth removed. She’s in good hands; top London dentist Peter Kertesz is also an expert in animal dentistry. The last time he was at Paignton Zoo, in December 2015, his patient was a gorilla; before that, a tiger. Gemini (also known both by her rather impersonal collection number 9925 and her keeper pet name of Klara) is just over two years old and around 30 kilos in weight. She was born at Living Coasts in June 2014. When her mother was unable to produce milk, zoo keepers stepped in to feed her creamy fish milkshakes around the clock. They also taught her to swim. In preparation for the op, she has been trained to go into a special travel crate; on the day she obliges and is driven to the Zoo by her keeper, Libor Mach. For most dentists, staring into the mouth of a large animal would be a little disconcerting, but Peter Kertesz is not the sort of man to get nervous. He’s one of only a few specialist zoo dentists in the world. He has worked on exotic species – including gorillas, whales, pandas and elephants – all over the globe, from Britain and Europe, Hong Kong, Moscow and the Middle East. The team assembled for this job includes vets Jo Reynard and Ghislaine Sayers and vet nurse Celine Campana, all from Paignton Zoo, plus Paignton Zoo Mammal keeper Kate Jenner and Living Coasts keeper Libor Mach. 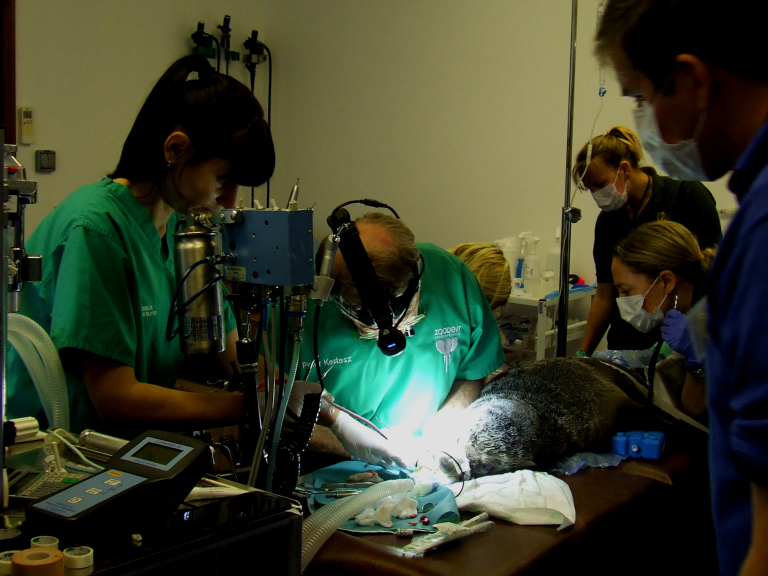 Peter is assisted by his dental nurse, Monika Mazurkiewicz. There’s an impressive array of equipment on hand, ranging from an anaesthetic machine with a circle circuit – to do with breathing - and the IV system for fluids to drugs with long names, blankets to keep her warm and a blow pipe to deliver the initial sedative. They are also geared up to take radiographs and blood samples and to administer anti-inflammatories, pain-relief and antibiotics. A seal under general anesthetic needs careful monitoring: they can be prone to hyperthermia, they are very sensitive to small changes in anaesthetic gas and their natural dive response - evolved to cope with deep dives in cold waters – can cause their breathing and heart rate to slow dramatically and their blood circulation to reduce. Clare Rugg, Operations Manager at Living Coasts: “Dentistry is a highly-specialist field, all the more so in exotic animals. Gemini deserves the best and gets it.” Several smaller teeth have to be removed in order to get at the canine, but the operation is a success; they finish by taking the opportunity to do a full clinical exam, including eyes, ears, skin, heart, abdomen, flippers and reproductive tract. In the days afterwards, she is a bit sore and off her food, but with time and a little pain relief she soon brightens up, becomes more active and is soon eating well again. Peter Kertesz has a dental practice in London. His first experience of animal dentistry was when he looked at a cat for a vet in 1978. He started working with London Zoo and the International Zoo Veterinary Group and set up Zoodent International in 1985. He takes the same rigorous approach whether his patient is animal or human: “People often ask me if it is fun working on gorillas and tigers. It certainly is not fun. It is very hard and serious work – the health and sometimes the life of a rare creature is in your hands.” For more information, go to www.livingcoasts.org.uk or ring 0844 474 3366.